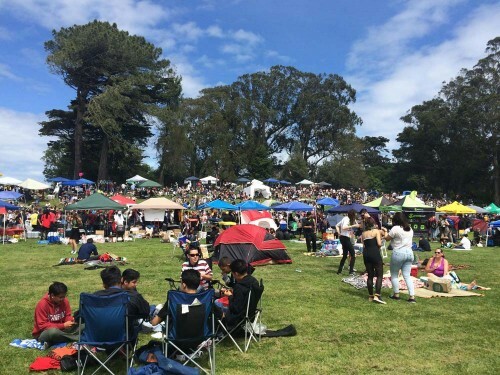 SAN FRANCISCO — Thousands sent up a cheer and a collective plume of marijuana smoke at the stroke of 4:20 p.m. Wednesday in San Francisco’s Golden Gate Park. They gathered at the park’s “Hippie Hill” to toke up, eat and drink the afternoon away into the night. A plane dragging a banner encouraging attendees to “smoke weed” circled overhead, while unlicensed vendors set up tables and makeshift tents to sell all types and strains of bud, not to mention T-shirts, pipes and food. This year’s celebrations of all things marijuana throughout the U.S. come amid loosening restrictions and increasing tolerance for the plant’s use from Alaska to Massachusetts. 86-ing 4/20: Has CU-Boulder snuffed out the annual pot holiday? Marlene Manning, pushing a stroller with her 6-month-old granddaughter, was glad to be back in her native California for the annual 4/20 celebration. She wasn’t partaking, but said she was celebrating freedom. It could be the last unofficial pot holiday on which users have to call for legalization in California, with a pot initiative expected on the November ballot. The drug’s use for medical purposes got approved in 1996. In Anchorage, Alaska, a downtown marijuana pot club has scheduled a “420 Blaze Party” in a state where recreational use is legal but sales of weed aren’t until later this summer. “We’re a private club, we’re an events club and our members can consume their own product,” said one of the owners, Theresa Collins. The club is offering a free shuttle home for attendees. Several Las Vegas marijuana businesses held grand opening ceremonies, including the Cannabis Chapel, which offered customers a pot-themed wedding package complete with a silk cannabis bouquet — all for $104.20. Nevada voters legalized medical marijuana use in 2000, but it wasn’t until 2013 that lawmakers created rules allowing for dispensaries. Associated Press writers Lisa Rathke in Burlington, Vermont, Mark Thiessen in Anchorage, Alaska, Kristin J. Bender in San Francisco, Michelle Rindels in Las Vegas and Kathleen Ronayne in Concord, New Hampshire contributed to this report.